The fourth round of the 1980 Citicorp Can Am Challenge Cup took place at the historic Watkins Glen. The dominant team since the re-birth of the series in 1977 was the Haas/Hall factory Lola entry. Their driver was Patrick Tambay, a former champion, returning after a couple of years in Formula 1 with McLaren. Tambay won the first three races of the season - Golden State (later renamed Sonoma), Mid-Ohio and Mosport. Much of this early season success could be attributed to not only Tambay's driving skill but also the team's preparation. Ground-effects were introduced to many of the new Can Am cars in 1980, which meant that teams had to contend with a new variable. 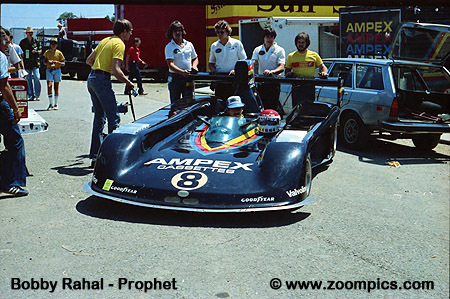 Understanding ground-effects was such a challenge that Bobby Rahal's crew removed the skirts from his Prophet at Mid-Ohio. This allowed him to qualify on the pole, however, his time was only a third of a second quicker than Keke Rosberg's lap record. Lola's latest creation the T-530 incorporated ground-effects and originally suffered from poor straight-line speed and understeer. With few alternatives on the market, most of the top teams chose this model to contest the season. 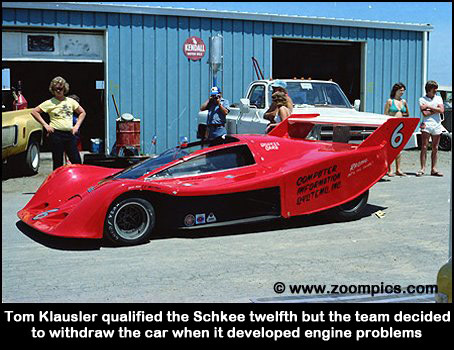 The Haas/Hall team was able to solve these problems quicker and unlike the competition was finishing races. As a result, Tambay entered Watkins Glen with a 20-point lead in the Driver's standings. The next closest driver in the point's chase was Geoff Brabham with 7 and tied for third with 6 points were Al Holbert, Elliott Forbes-Robinson and Bobby Brown. However, the competition was coming to grips with the new cars and by Watkins Glen, the Haas/Hall team would find that being at the front of the grid was becoming much more challenging. 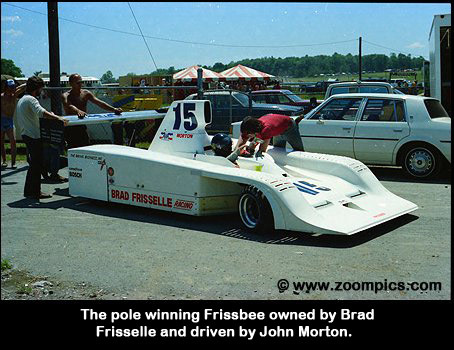 Returning, after missing Mid-Ohio and Mosport, due to budget constraints, was John Morton in the Trevor Harris designed Frissbee. Much pre-season talk surrounded this car as Morton turned a 1:11.4 at Riverside during testing - well under Keke Rosberg's lap record of 1:12.733. At Golden State, he qualified the car on the front row and was the only driver that could stay with Tambay. At Watkins Glen, Morton grabbed the pole with a time of 1:39.665. Qualifying in the 1:40s were Geoff Brabham driving for Count Rudy van der Straten and Elliott Forbes-Robinson part of Paul Newman's team - both in Lola T-530s. Tambay was fourth quickest, however, he was almost 2-seconds slower than Morton. Qualifying fifth was, Elliott Forbes-Robinson's teammate, Stephen South a star from the Formula 2 series. Next was Bobby Rahal in Herb Caplan's Prophet. 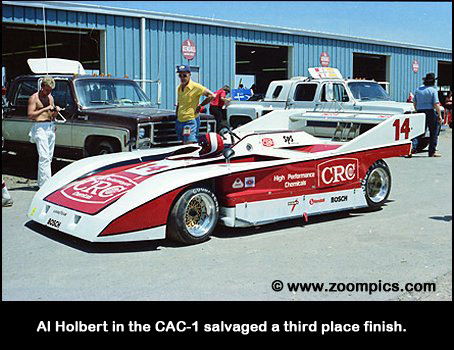 Starting seventh was Al Holbert in a car called the Holbert CAC-1, which was designed by Lee Dykstra. Fastest of the non ground-effects 5-litre cars was Bobby Brown in a Lola T-333CS. 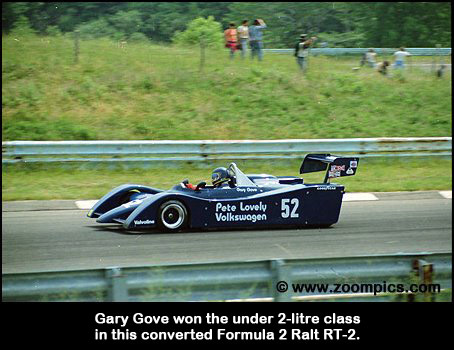 Gary Gove led the under 2-litre contingent with a 1:50.285 in a converted Ralt Formula 2 car. He qualified almost 1.5-seconds quicker than the next under 2-litre car of Bertil Roos. Qualifying had produced some unexpected results and the race would prove no less interesting. There is an old expression in car racing - "That the race can not be won in the first corner", however, this concept seemed to be lost on Tambay. He made a good start allowing him to draw alongside Brabham and Morton - making it three-wide into the first corner. Morton had the inside line and braked early with Brabham in the middle who had no alternative but to make contact with Tambay. This forced Tambay off course and by the next lap Brabham had a comfortable lead followed by Morton, Tambay, Forbes-Robinson and South. The race took an interesting turn on the fourth lap when Forbes-Robinson attempted to pass Tambay at the Scheckter Chicane (since removed but previously located at the Esses). As Forbes-Robinson braked the back wheels locked up sending the car sideways and with no where to go he was collected by his teammate South. Just four laps into the race a quarter of the twenty-car field was gone. Prior to the incident, Michael Prevost was black-flagged and R.J. Nelkin crashed at turn 5. On the same lap as the teammates collided, Tony Cicale retired with electrical problems. The top three, Brabham, Morton and Tambay, ran in close quarters until the tenth circuit when lapping the Lola T-294 of Steven Payne-Herbert. The under 2-litre car lost its engine in turn-7 and dropped a considerable amount of oil. Brabham was quick to avoid the oil slick, however, Morton spun but was able to continue. 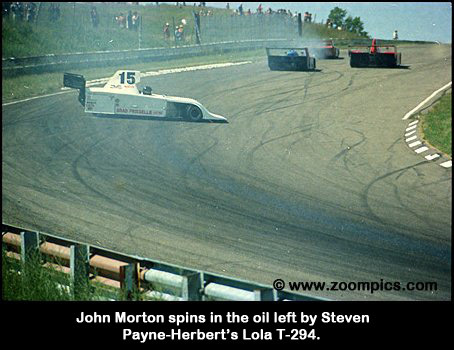 Morton was able to make up the lost time and got within a second of Brabham by the time the pair pitted on lap-37. The van der Straten and Frisselle teams were positioned at opposite ends of the pit lane. Morton's crew was located at the entrance of the pits and provided him with a very quick stop. He reached Brabham's pit having got up to speed just as the van der Straten crew waved their driver out. Unfortunately, the two cars made heavy contact at the pit exit and were unable to continue. A lap later Bobby Rahal retired the Prophet with a broken upright. This left only six cars running with seventeen laps remaining. The leader was now Tambay, who had a one-lap margin over Danny Sullivan in the Intrepid GB1 and Holbert. They would run this way to the checker with Brown finishing fourth overall followed by Gary Gove the under 2-litre category winner. Tambay's victory was somewhat remarkable as it was accomplished without a clutch, second and fourth gears and a deflating tire. But the finishing order of races are not always settled on the track. Citing two incidents, Garvin Brown Racing the entrant of Danny Sullivan's Intrepid filed a protest against Tambay. First, they maintained that Tambay passed Morton during the full course yellow that occurred as a result of the Forbes-Robinson/South accident. 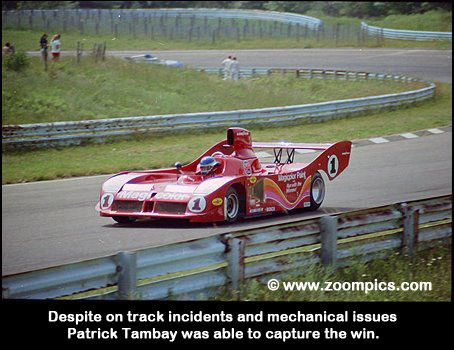 At the time, however, Tambay realized his mistake and allowed Morton to take back his second place. They also claimed that the Haas/Hall team had too many crew members over the wall during a pit stop. The protest was later withdrawn as the team felt it would not have been a proper win and would only have adverse consequences for the series. A casual review of this race - Tambay's fourth win in four races, a one-lap margin of victory with an ailing car and only six finishers - would suggest a boring and predictable event. However, there was enough drama throughout to make it one of the most interesting races of the 1980 campaign.